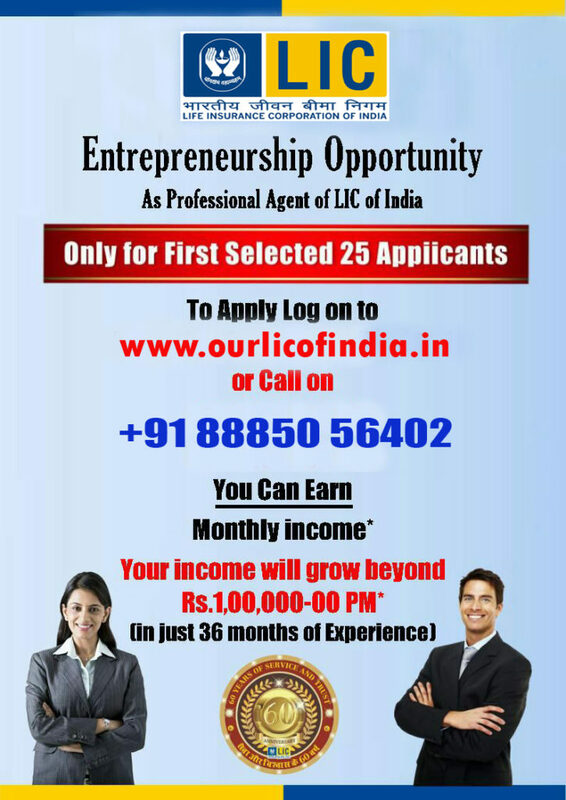 LIC recruiting City Career Agents by offering monthly stipend along with Commission. World’s No.1 Life Insurer LIC recruiting Salaried PartTime/ FullTime City Career Agents. People already working can also join as Part time CCA. With one successful sale, you are assured of income for 20 years. The only Govt. job that gives you flexible timings. Get guaranteed Rs. 50000+ income, dream car & dream home with in maximum 5yrs in zero investment. Generating an additional income with existing contacts list. No Investment only Achievement – Club members, COT, TOT, MDRT, etc. Only profession which you can do even in part time with Govt. Guarantee & get facilities of big Ltd. co. like Gratuity , Renewal Pension , Group Insurance , Two wheeler/Four wheeler, Computer/ Laptop etc inter. This entry was posted in Agents Recruitment and tagged agents recruitment, careeer agents, career agency, cca recruitment, city career agents, lic career agents, lic cca recruitment, lic recruitment, recruitment of city career agents. Bookmark the permalink.